The bishop who welcomed Father Alberto Cutie into the Episcopalian Church is defending the celebrity, now-former Roman Catholic priest widely known as "Father Oprah" and "Padre Oprah." Cutié, a handsome, charismatic TV talk show host, radio personality, newspaper columnist and author was caught in photos and on video kissing a woman. The Catholic church relieved him of his duties and took him off the air and, on Thursday, Cutie formally became an Episcopalian. The photos almost single-handedly reignited the debate over the celibacy required of priests by the Catholic Church and that church's refusal to allow priests to marry. Episcopal clergy are allowed to marry. Earlier this month, in an exclusive interview with Early Show co-anchor Maggie Rodriguez, Cutie revealed that a longtime friendship with the woman he was spotted with became romantic about two years ago, and added that they're in love. Conceding he'd become "kind of a poster boy" for the debate over priests being celibate, Cutié said priestly celibacy is good, but should be optional. Overall, he said he's "deeply sorry" about all that had happened. "I don't want to be the anti-celibacy priest," Cutie said at the time. "I think that's unfortunate." On The Early Show Friday, Rodriguez, whose family in Miami has been close to Cutie for years, spoke with Bishop Leo Frade, the head of the Episcopal Diocese of Southeast Florida. He officiated at the ceremony Thursday at which Cuite and the woman who's now his fiancée converted. Rodriguez said, "I know Father Cutie believes, because he said it on this program, that what he did was wrong. He broke an oath and he lived a lie for two years. Are you concerned at all about the message that you're sending your parishioners by inviting someone like that into your church?" "Well," Frade responded, "for a single person, kissing and loving another single woman, I think that a scandal would have been if he would have been -- if she would have been a married woman or something like that. But Father Cutie is a single person, loving another single person, and when you have to obey your heart, indeed, the teaching that he could tell our people is that love is able to conquer everything." Asked why he welcomed Cutie into his church, Frade explained, "We have been talking to him as friends. We've known each other from the year 2000. We are both Cubans, and dealing in ecumenical and also trying to bring a peaceful change in Cuba. And he became more and more interested in our church, and showed that interest, and with time, about two years, it has been a long search for him, because he did not want to leave the Catholic faith. Actually, he traded his collar, his Roman Catholic collar for another different Catholic collar, which is the Anglican, the Episcopal collar." At a news conference Thursday, Cutie said, "I have searched my soul and sought after God's guidance for a long time. I have spoken to friends in and outside the Episcopal church about their service to God. I have seen the ways that many of my brothers serve God as married men. ... I would never hurt anyone deliberately especially my family, my friends and the church community. I will always love and hold dear the Roman Catholic Church." CBS News Analyst Father Thomas Williams told Rodriguez he's "really hopeful that Father Cutie has made this decision to become Episcopalian because he really believes it's a true church and not because of some other motive. That's my one hope. And the fact that he's been speaking with Bishop Frade for years actually gives me hope that that might be the case, that he really believes that what he's doing is the right thing." 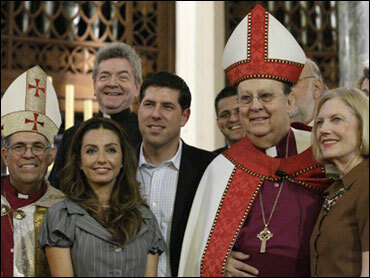 But the leader of the Miami archdiocese accused Cutie Thursday of abandoning his church and his flock. "Father Cutie's actions have caused great scandal within the Catholic Church," said Archbishop John Favalora. "and led to division within the ecumenical community and the community at large. Today's announcement only deepens that wound."